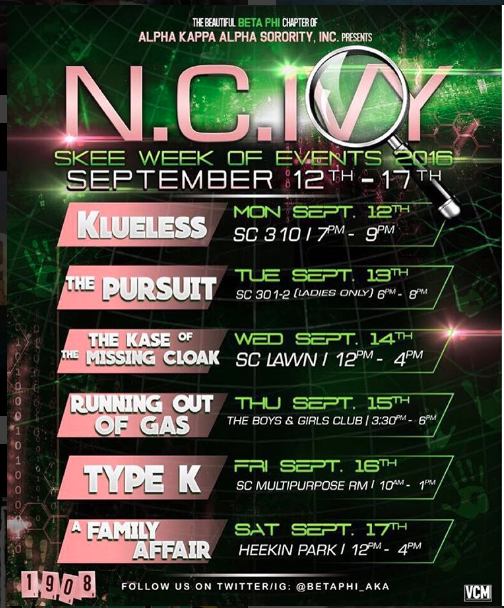 The theme for this year's week of events was "N.C.IVY." This was a mystery-themed week. Ball State students and other participants were sent on various missions throughout the entire week. Each night they were given a clue. This kept our participants engaged throughout the week. "Klueless" was an event geared towards Alzheimer's Awareness. We had a discussion about Alzheimer's, played brain-stimulating games, and gave out prizes. "The Pursuit" was an all girls event. Participants were sent out on a mission in which they collected clues to solve our mystery. During "The Kase of the Missing Cloak" we collected donations from Ball State students. We received over 300 articles of clothing for Muncie Mission and over $100 for Motivate our Minds. "Running Out of Gas" was a food insecurity event that was held at the Boys & Girls Club. There was a fun interactive story about the importance of eating well read to the kids and treats were given out afterwards. Our "Type K" blood drive had a great turn out. 20 people registered to give blood, and 13 units of blood were collected. "A Family Fair" was an event geared towards bringing families and the community together. It was a day full of games, face painting, arts and crafts, prizes and more.